No significant increase in Atlantic hurricanes since the late 1880s has been observed. The number of hurricanes that make U.S. landfall has not significantly increased or decreased. In the future, it is likely that global frequencies of tropical cyclones will either decrease or remain essentially the same as a result of projected greenhouse gas induced climate change, though rainfall rates related to such storms are likely to increase. There is low scientific confidence that overall storminess has changed, however, it is likely that there has been a human-induced increase in coastal extreme sea level events due to overall sea level rise. Researchers at Colorado State University say the devastation caused by Hurricane Sandy in October was not caused by human-induced climate change. “As extensive and tragic as Sandy’s spawned destruction has been, it is not beyond the range of what is known about the variability of rare but extreme cyclone events,” Gray and Klotzbach wrote. The researchers acknowledge that human activity has led to an increase in carbon dioxide being released into the Earth’s atmosphere and an increase in average temperature. But Gray and Klotzbach do not think that has caused more frequent and powerful hurricanes to form. 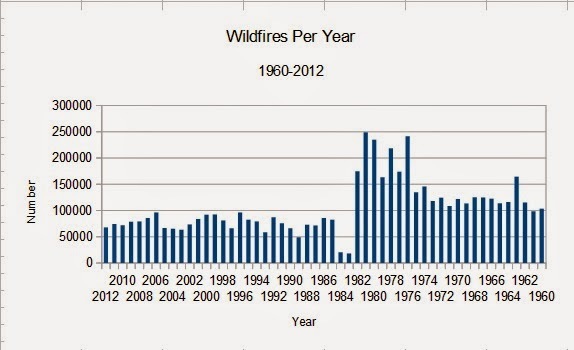 As for the claim climate change is causing more wildfires, that is false too. Data (1960 on right) from nifc.gov.